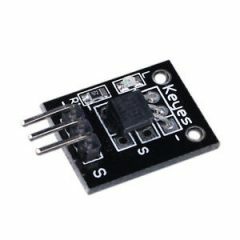 Arduino Temperature Sensor Module Keyes KY-001, Allows ambient temperature measurement using digital serial bus. 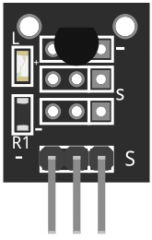 The KY-001 Temperature Sensor Module consists of a DS18B20 single-bus digital temperature sensor, a LED and a resistor. Compatible with popular electronics platforms like Arduino, Raspberry Pi and Esp8266. Connect the Power line (middle) and ground (-) to +5 and GND respectively. Connect signal (S) to pin 2 on the Arduino. 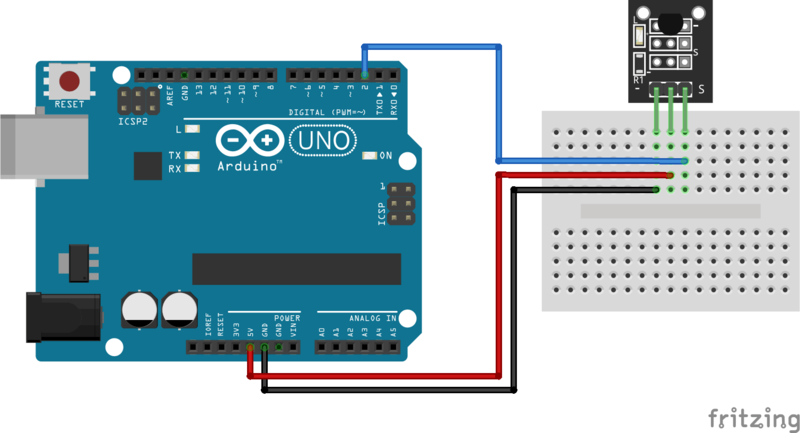 The following Arduino sketch will use the OneWire library to serially communicate with KY-001 and it'll output the temperature read by the device. Links to the required libraries for the KY-001 Arduino example sketch can be found on the Downloads section below. Fritzing Part: KY-001 Temperature Sensor Module. Dallas Temperature Control library by Miles Burton. DS18B20 Datasheet by Maxim Integrated.